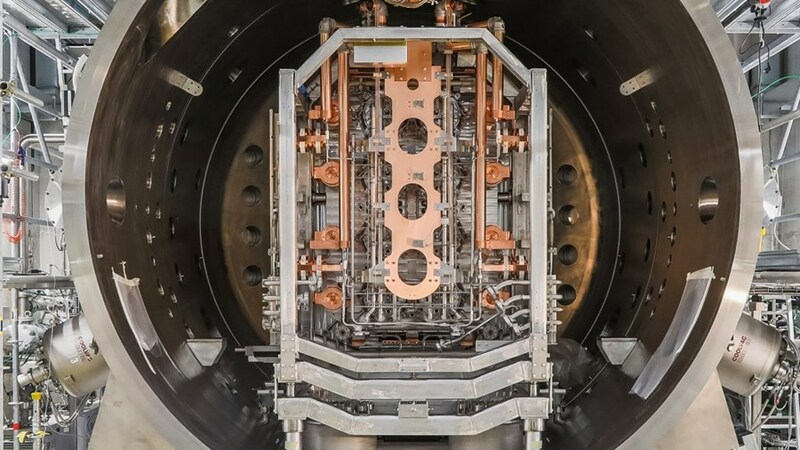 The critical technologies of neutral beam injection—the workhorse of ITER plasma heating—will be demonstrated in advance of ITER operation at a test facility located in Padua, Italy. Integrated commissioning of the facility's SPIDER* test bed officially started on 9 March after the installation of the high-tech SPIDER beam source, procured by Europe. The SPIDER beam source—a technological marvel and the world's most powerful negative ion source. A European consortium consisting of Thales (France), CECOM Srl (Italy), Galvano-T GmbH (Germany) and E.Zanon SpA (Italy) has been responsible for the manufacturing of the equipment, the vacuum vessel and the handling tool. 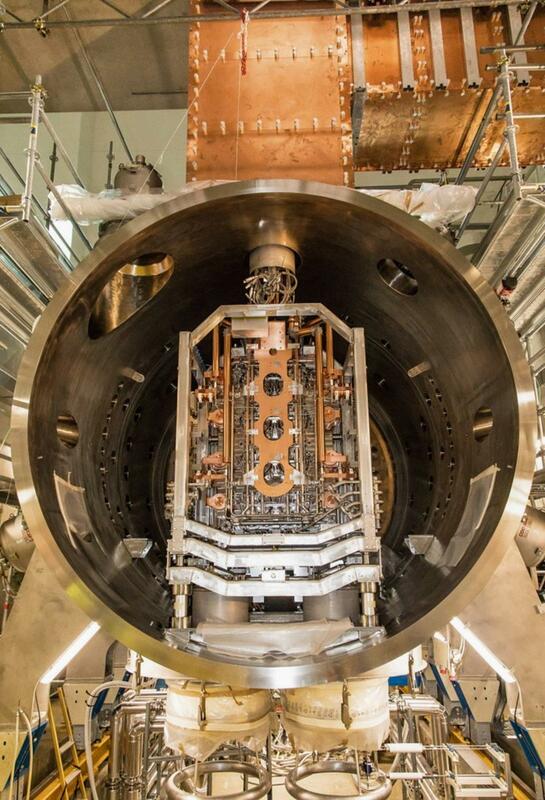 The key aspects of the ion sources for the heating and diagnostic neutral beam injectors at ITER will be tested on SPIDER, an ITER-scale negative ion source now fully assembled at the Neutral Beam Test Facility in Padua, Italy. 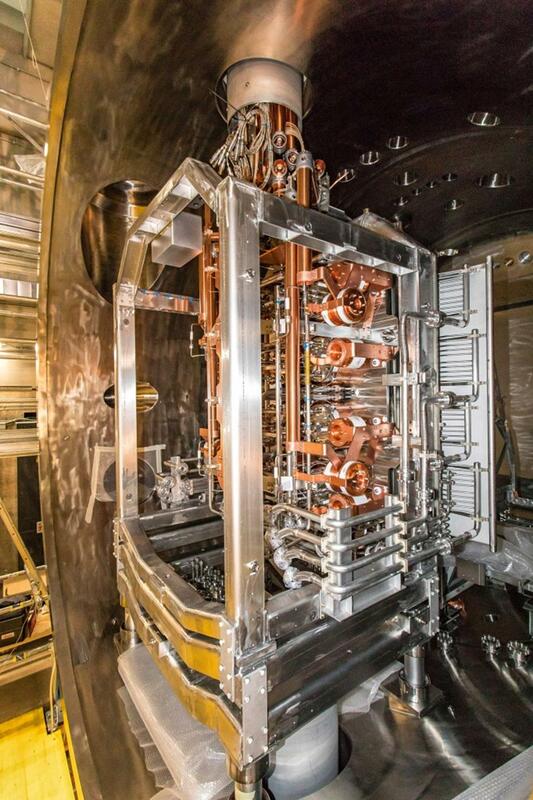 The last major component—the neutral beam source—was delivered to the test facility last October, and in the months that followed the source successfully passed pressure, leak, magnetic field mapping, and electrical tests. Designed and manufactured with cutting-edge technologies under a Procurement Arrangement with the European Domestic Agency (and with the design and engineering contribution of ITER Organization and Padua host lab Consorzio RFX), the SPIDER beam source will be a stepping stone for the development of neutral beam injection—the powerful system that will inject 33 megawatts of heating power into the ITER plasma. The highly energetic neutral atoms in the neutral beams will transfer their energy through multiple collisions to the ions, increasing the plasma temperature to the level required to initiate fusion. This temperature will reach 150 million degrees Celsius, about 10 times the internal temperature of the Sun. The most challenging components of the heating neutral beam program will be put to the test at the Neutral Beam Test Facility, hosted by the Italian research organization Consorzio RFX in Padua. The European, Japanese and Indian Domestic Agencies are all contributing to those components according to the technical specifications included in Procurement Arrangements signed with the ITER Organization; Italy is building the facility as a voluntary contribution to the neutral beam development program. 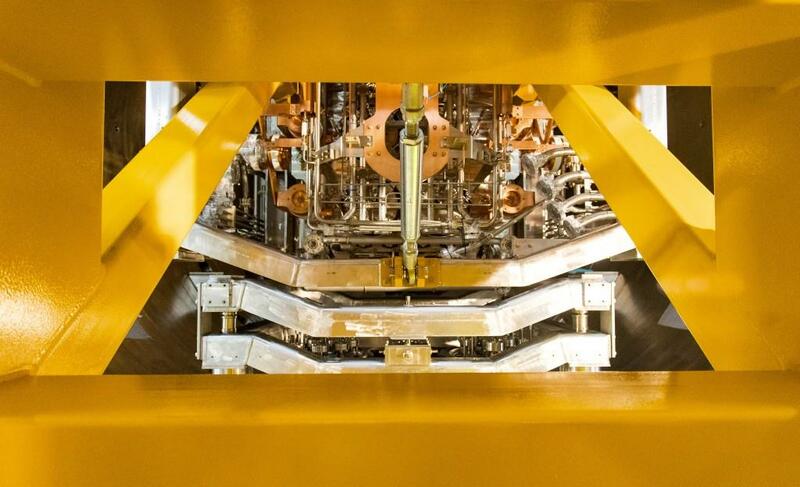 Two test beds are under development at the Neutral Beam Test Facility—SPIDER which will test and develop the ITER full-scale radio-frequency negative ion source; and MITICA, where a full-power 1MeV accelerated beam will be tested at full pulse length in demonstration of the heating neutral beam used in ITER. The SPIDER beam source is an ITER-like full-size radio-frequency-driven plasma source capable of extracting a negative deuterium ion beam (D¯ beam) of 70A and then accelerating it to energies of 100 keV. It will contribute to optimizing the production and extraction of negative ions as well as to establishing operating techniques. It will also offer the chance to measure the uniformity of the extracted beam for the first time at ITER scale. Operating the SPIDER test bed is a necessary milestone on the path to heating the future ITER plasma. After five years of manufacturing and lessons learned, the beam source was delivered to the neutral beam facility where it successfully passed all site acceptance tests. More recently, on 16 February, the five-tonne beam source was transferred from the clean room where it was stored and tested to its final operating position inside the SPIDER vacuum chamber. The copper grid apertures (which guide the neutral beam into 1,280 small beamlets) as well as the overall position of the beam source were thoroughly controlled by metrologists using laser trackers to ensure the correct aiming of the beam. 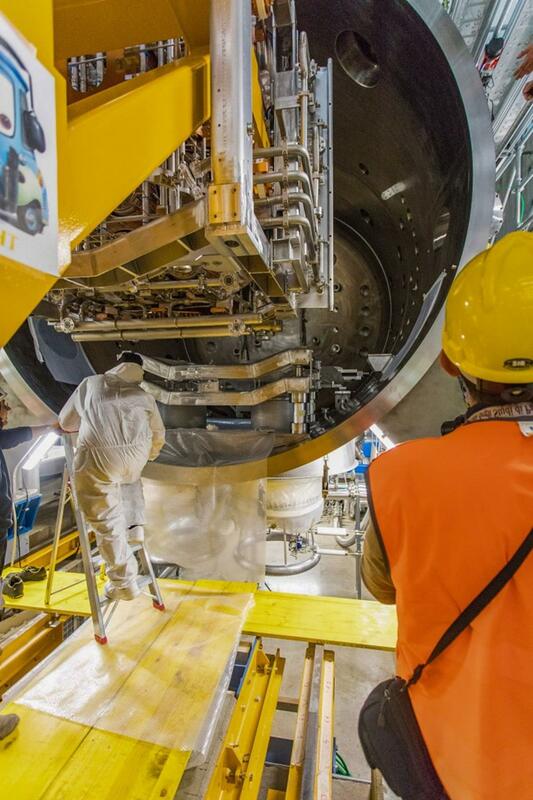 The final auxiliary services (water, electrical, radio frequency, thermocouples) were connected and the vacuum vessel was closed and evacuated, allowing the ITER Organization, the European Domestic Agency, and Consorzio RFX to start integrated commissioning activities. This important step forward for the ITER neutral beam program also represents the on-time achievement of an ITER Council milestone. *SPIDER = Source for the Production of Ions of Deuterium Extracted from RF plasma. Read a recent report on the European Domestic Agency website. A ceremony was held in October 2017 for the delivery of the beam source at Consorzio RFX. 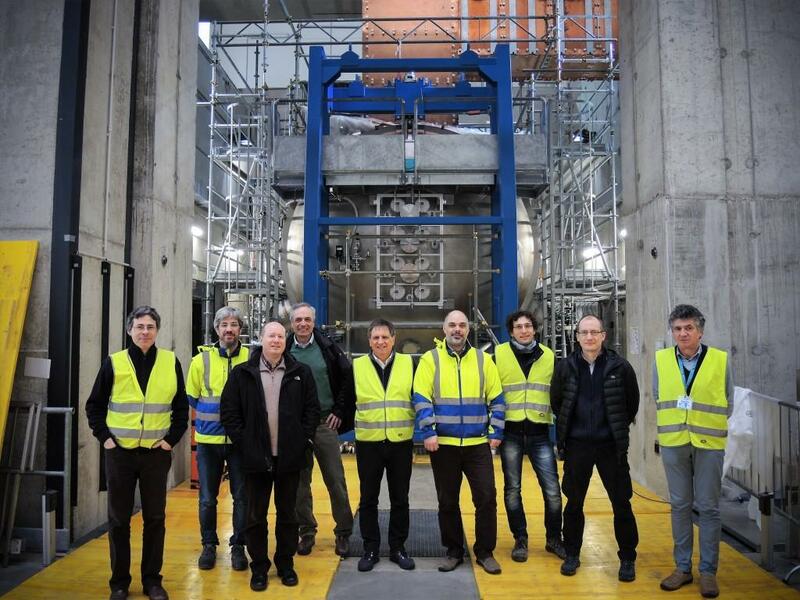 Present were representatives of the ITER Neutral Beam Section, the European Domestic Agency (responsible for the beam source procurement), facility host Consorzio RFX, and manufacturer Thales. 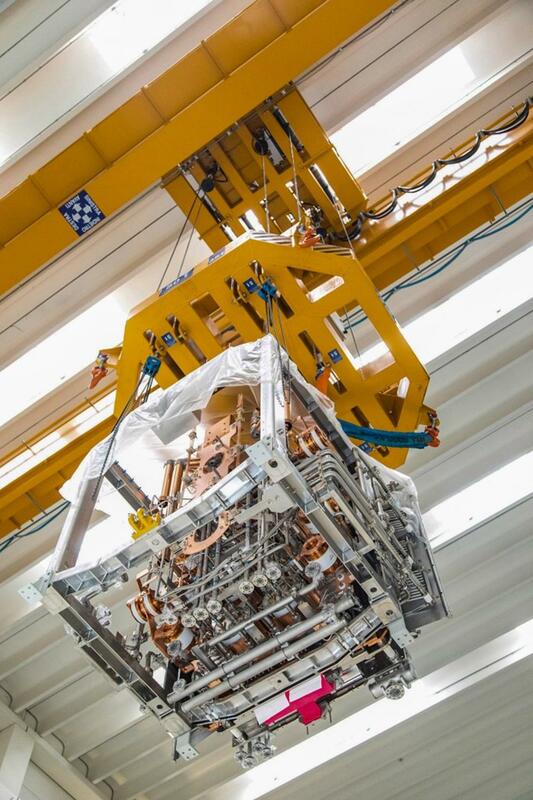 On 15 February, the five-tonne SPIDER beam source was transferred from the clean room where it had been stored and tested ... to its handling tool, using the Neutral Beam Test Facility's 50-tonne crane. A dedicated handling tool, provided by the suppliers, was used to transfer the beam source onto its bed support structure in the vacuum chamber. The SPIDER beam source is an ITER-like full-size radio-frequency-driven plasma source capable of extracting a negative deuterium ion beam (D¯ beam) of 70A and then accelerating it to energies of 100 keV. Manufacturing required just over four years. On 16 February, the SPIDER beam source was successfully installed in its final operating position in full respect of an ITER Council progress milestone. Only auxiliary connections remain to be finalized. The ITER Organization, the European Domestic Agency, and Consorzio RFX can begin integrated commissioning activities. 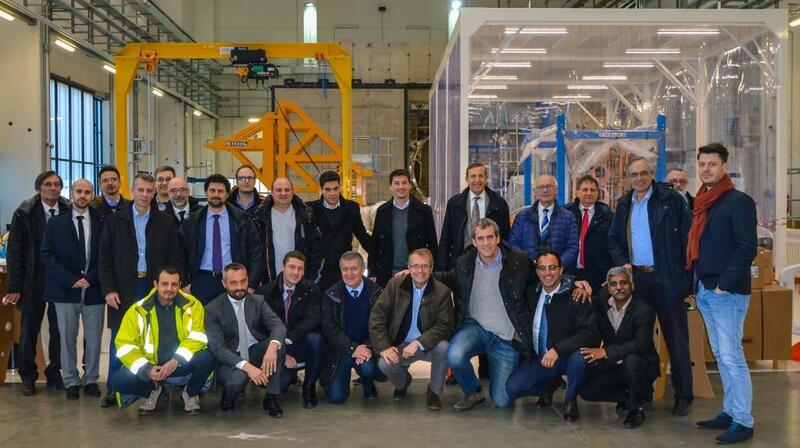 The Consorzio RFX leaders for diagnostics, interlock and control, thermo-mechanics, and power supplies stand with NBTF project leader Vanni Toigo (centre) in front of the sealed SPIDER vessel.